Below you can find driving directions from Google Maps to help you get from Miami City to your nearest Fix Apple Now store, situated in Hallandale. You can either copy the driving instructions below or click here for a larger map and driving directions. Talk to Fix Apple Now today if you need to repair your iPhone in Miami City. Our engineers are amongst the most experienced and skilled in the business. We can solve a host of problems related to broken Apple devices, so why not get in touch today if you're seeking enlarged images or icons filling your screen, your incoming call screen is not displaying, your home button won't work or your hearing crackling through your headphones. We can be counted on to deliver the outstanding service that you're looking for, so don't head anywhere else if you need a quick, effective fix for your Apple device. Whether you need a fix for your iPhone 4,5 or 6, iPod, iPad, iMac, MacBook or Mac Mini, we can help. We can get your device back to you quickly and what's even better is that we offer some of the market's most competitive prices. 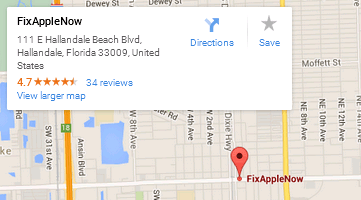 Talk to us today if you need to fix your Apple device in Miami City.